Corporations are soulless entities possessing privileges and the rights of citizenship that actual people have; all the while not having to shoulder any of the natural responsibilities. 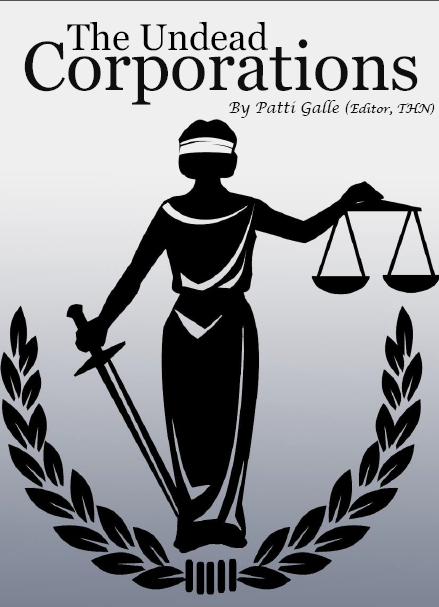 Undead Corporations have concentrated the essence of avarice, rage and fury to form their corporate structure. And as these covetous Corporations have accumulated immeasurable wealth they have methodically utilized this wealth and power to procure, infiltrate, and seize control of the influential and powerful American government and many governments across the world vigorously fusing them into a globe-encompassing non-living aberration, now rightfully called or labeled as Corporatocracy. At present, on an ever escalating level, world governments are virtually serving only the interest of the wealthy and corporate profits at the cost of workers, communities, consumers, and the environment. Worldwide inequality continues to rapidly increase between the rich and the poor. At this juncture in time the extremely wealthy elite, intermingled with giant corporations are making obscene profits, purchasing the majority of politicians and directing our leaders and elections. The market, technology, and increased militarism have reduced human beings to mere mechanical commodities whose only usefulness and value lies in selling labor and consuming products. Our natural resources, institutions, and the general population must be used up and then discarded when they are no longer useful because profits must always be maximized. Corporations must always be on the outlook for more markets to lay claim to, and the military Corporations like Lockheed Martin and Boeing must always find more countries to invade. The wars in Iraq and Afghanistan are the insidious handiwork of these Undead Corporations that have seized control of America and its institutions. America was once a Democratic Republic, but many Americans are waking from their slumber to find that America is no longer a Democratic Republic but has become a "Corporatocracy," one in which they are now governed and ruled by an alliance of gigantic Corporations, the extremely wealthy elite and Corporate-assisted (bought and paid for) government officials. And these Corporations march unabated like the Undead across the globe devouring anything and everything in their sight. Nonetheless, the truth of such terrifying oppression and tyranny is not enough to force the majority of us from our comfortable couches to take action. Some contend that this political passivity is caused by ignorance due to corporate media propaganda from powerful media networks like Fox News, and extremist right–wing talking heads like Glen Beck and Rush Limbaugh who consistently brainwash the lower classes into fighting against their own interests while other believe the passivity to organize is a directly connected to a lack of money. But perhaps the frightening truth is actually because too many of us have become politically pacified by Corporatocracy-created institutions and culture exactly like the soulless Undead Corporations planned and wanted. The time has come for us to ask the question of how we regain our backbone, our courage and solidarity and shake off the shackles of the Corporatocracy. We can no longer sit by and idly watch as greedy Corporations continue to consolidate around the globe getting their rapacious undead tentacles into the people and the natural resources of every place in the world they lay claim The world has been desperately in need of a movement, a global game-changer that involves a very broad mass of the marginalized, poor, and unemployed and especially the world’s youth that are so dramatically affected by rapacious Corporate economic injustice. A movement has been desperately needed that consists of people who resent the corruption and the social status quo and understand that there is a link between Corporatocracy, militarism and corruption. The great American political activist Howard Zinn said "If there is going to be change, real change," "it will have to work its way from the bottom up, from the people themselves. That's how change happens." Professor Zinn explicitly understood how imperative it is for students and peoples throughout the world have a detailed understanding of history. Zinn stated "To me, understanding history is a matter of life and death," "If you don't understand history, you're a victim." What Zinn meant was that if citizens didn't understand their own history of exploitation at the hands of the robber barons and industrialist, who fought for deregulation at the expense of their employees in order to accumulate larger profits, then they would be doomed to repeat those tragedies. Fortunately it would appear that enough world citizens are learning their true history lessons from their many brothers and sisters who are now actively engaged in the social justice struggle world-wide. I believe if the great Howard Zinn were alive today he would be tremendously pleased to be witness to the bottom up, citizen driven out-break of demonstrations and occupations in America and around the globe that’s demanding political change. Tens-of-thousands of people, young and old, around the world are getting off their couches to flood out into the streets and force the world's leaders listen to their cries against poverty and injustice. These brave citizens are helping organize a movement that breaks down barriers to create a just and fair economy in all societies. We at The Hacker News stand in solidarity with those all around the world that are in the streets, in the parks, in the roads and in the cyber world that are helping place a stake in the heart of the Undead Corporations.